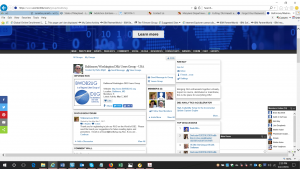 Posted by Kim May on March 2, 2018 under Baltimore Washington DB2 Users Group, DB2 for z/OS, IBM Champion, SQL Tuning. The meeting is scheduled for Wednesday, March 14th, from 9:00am – 4:00pm. The cost is $250 in advance and $350 at the door. Register HERE. March is of course the group’s annual education session. This year the group has invited Tony Andrews of Themis to present. Tony’s full-day session consists of topics selected specifically to assist developers with Db2 SQL programming performance and best practices. Attendees will gain knowledge of SQL programming, performance and tuning, and the SQL-PL native Stored Procedure language. Tony Andrews has more than 25 years’ experience in the development of relational database applications. For most of this time he has provided development and consulting services to Fortune 500 companies and government agencies. Tony has written literally thousands of queries and programs and has also served as a database analyst. For the last 10 years Tony has been splitting his time between performance and tuning consulting engagements and training. His main focus is to teach today’s developers the ways of RDMS application design, development and SQL programming — always with a special emphasis on improving performance. He is a current IBM Champion, and regular speaker at many regional user groups, IDUG NA, and IDUG EMEA. He is also the author of a book for developers titled ‘DB2 SQL Tuning Tips for z/OS Developers’. Congratulation to the 2018 IBM Champions! Posted by Kim May on February 12, 2018 under Baltimore Washington DB2 Users Group, Frank Fillmore, IBM Champion, TFG Blog. My post is a bit late – and a bit self-referential. But sincere! Congratulations to all the 2018 IBM Champions!!! According to the IBM “Champion of Champions” Libby Ingrassia, IBM reviewed more than 1400 nominations, and selected 650 Champions for 2018. The Champions program recognizes and rewards independent IT professionals, business leaders, developers, and educators who influence and mentor others to help them innovate and transform digitally with IBM software, solutions, and services. Champions invest time supporting community efforts – coordinating users groups, writing articles and blog posts, presenting at conferences – and in a variety of ways that enable users to connect with the IBM community and succeed with IBM solutions. I am extremely proud to recognize so many names on the list who have worked with The Fillmore Group over the years, and who not only succeed in some of the most challenging customer environments, but take the time to share what they’ve learned with others and continue to support and promote the community. Libby has the names of all the 2018 IBM Champions in her January 31st blog post, and more interesting information on the program as well.